Bad cell phone photo. Sorry. But I’m just going to say this. If you’re Dustin Johnson and I know that I’m going to do a photo shoot for both GolfWorld and Sports Illustrated, don’t you think you’d at least change clothes? Instead, DJ shows up on the cover of both magazines with what looks like the same blue adidas shirt and the same white TaylorMade hat. 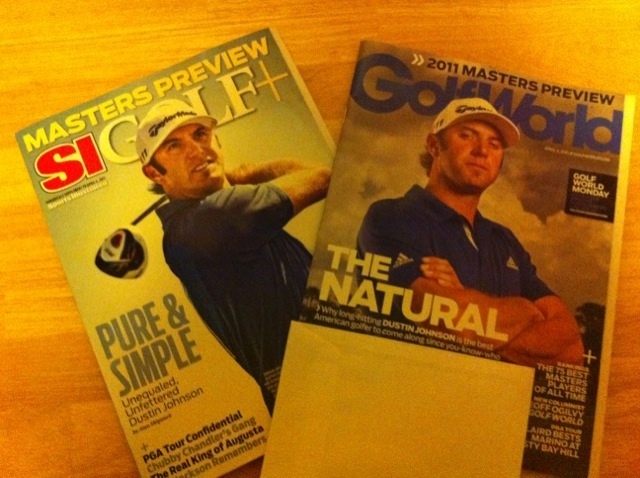 Can only imagine what the editors of each magazine thought when they saw the other.